Questions? Call us at (334) 793-9767. Patrons must be a library card holder, as well as a legal adult, to be eligible check out a pass/ticket. The patron's library card must be in good standing (capable of checking out library materials) to be able to reserve passes/tickets. If the patron has any fines associated with their account, they can pay them by logging into their account at https://www.dhcls.org/catalog/, and selecting "Fines" on their account page. The library card used to make the reservation must be brought to the library and used to borrow the pass/ticket. 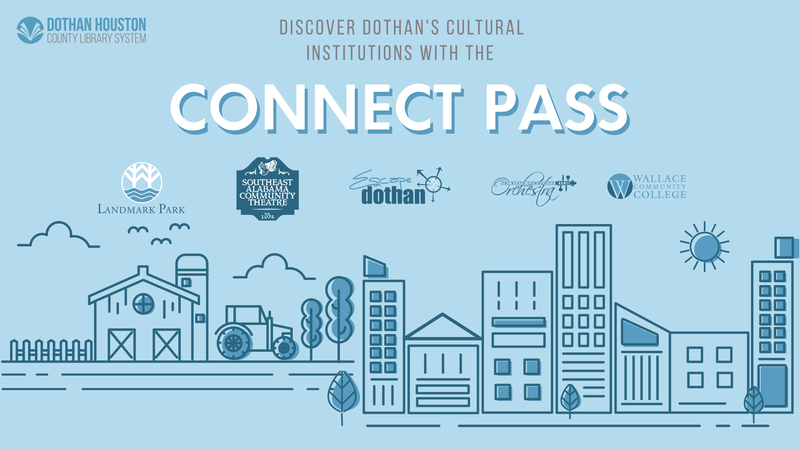 Passes/tickets must be picked up at the Main Library in Downtown Dothan. Multiple instances of passes/tickets being reserved and not picked up or cancelled could result in a library card being blocked from using the pass reservation system. An email confirmation of your reservation is NOT a pass or voucher to any location. All tickets, passes, and items are first come, first served. One (1) pass per reservation. Each pass is redeemable for one (1) ticket at participating theaters. Patrons will need to come in to the Main Library after reserving in order to receive the passes. The patron who reserved the pass will need to show their library card and photo ID to receive their codes. One (1) code per reservation. Each code admits two (2) people. Patrons will need to come in to the Main Library after reserving in order to receive the code. The patron who reserved the pass will need to show their library card and photo ID to receive their code. The code will not work after it has been used. Each pass admits four (4) people. The passes are only good for general admission, and do not cover special events at the park. Patrons will leave the pass at the park after it is used, and it will be returned to the library by the park staff. Patrons may hold on to the pass for up to thirty (30) days. Patrons will need to reserve for the date of pick up. Each pass admits two (2) people. Patron will need to come to the Main Library after reserving to receive their ticket. Ticket does not need to be returned to the library. Patrons will need to reserve for the date that they are visiting. Please call the Cultural Arts Center at least one day beforehand if special seating is required. Each reservation is for two (2) tickets. Each ticket admits one (1) person. Passes available starting May 1st, 2019. One (1) pass per reservation. Each pass is allows access for one (1) person at Water World.